Original Firemans Texas Cruzer 26". This is the classic Non-Loop tail version that is no longer being made. An original Firemans Texas Cruzer 26" built at an early factory which was in Pompano Beach, FL. 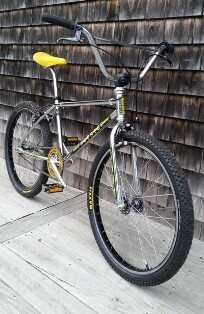 I acquired this classic bike from BMXLAZ. Bike has a fresh "black chrome" powder coated frame with gloss black fork and bars.